“Your crocuses are out,” I was informed. 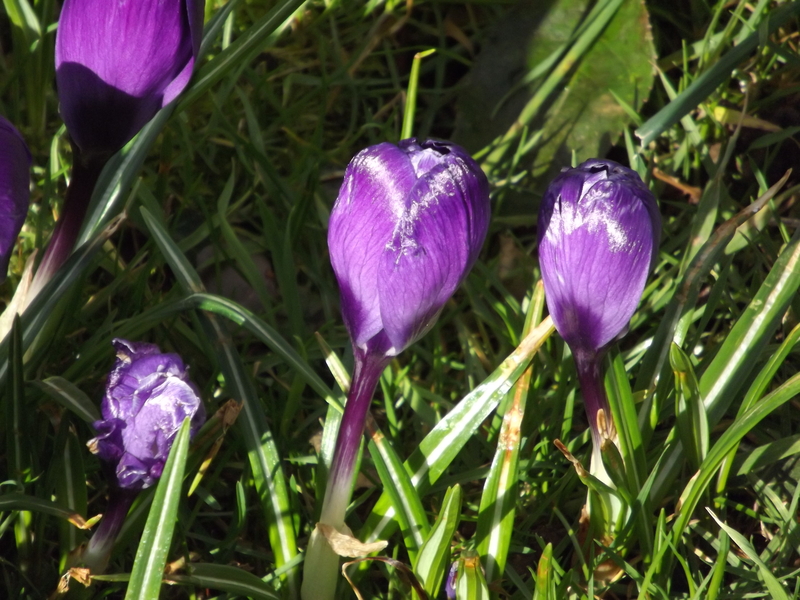 I resisted the temptation to reply, “Actually, it’s ‘croci’,” and instead looked out of the window to see a dozen or so violet flowers just beginning to show themselves. It’s been a topsy-turvy sort of a winter. One day quite warm, the next sleeting down and covering cars, roofs and gardens with a sprinkling of ice. One night cold, crisp and clear – and another night chucking it down with gale force winds to boot. 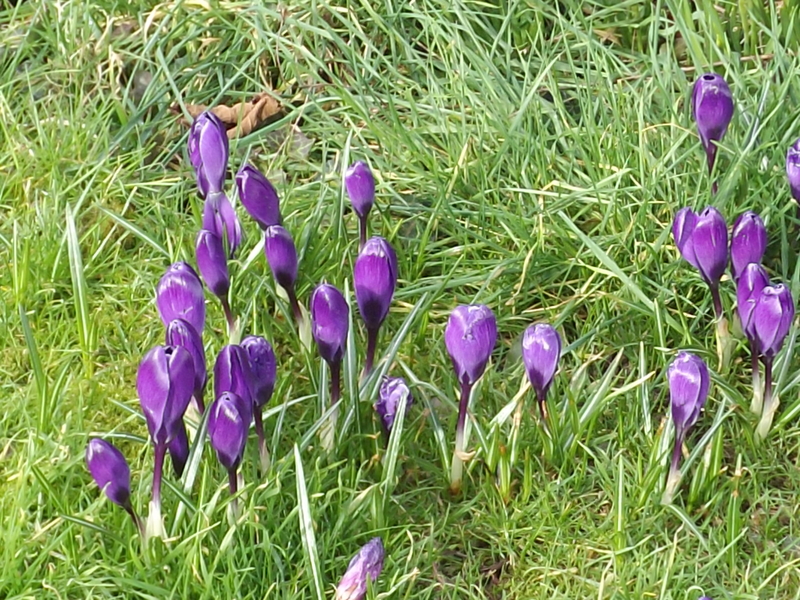 I would not be at all surprised if the croci (crocuses) decided to go back down again into the lawn! At least the days are getting longer and there is more daylight. As Christians we believe that Jesus Christ was executed unjustly but that after he was dead and buried, he was raised to new life by God’s Spirit. We celebrate this every year – do we realise what a big deal this is? Sometimes, I suppose, it all seems a long time ago and the excitement we might have once felt has faded. But it is worth taking time to remember. It is worth taking time to remind ourselves that Easter gives us hope for the future – and hope for the present: the same Spirit that brought new life to Jesus is one that God gives to us his Church. I know it does not always feel like that. Sometimes it must feel a bit like those crocuses (croci): we look forward to summer and yet we get ice dropped on us. Perhaps we wish we could go back and hide in the lawn. The weather might not seem too good but that does not mean that the days are not getting longer. Life might be hard sometimes, but that does not have to mean that we give up the promise of new life that Easter stands for. May we all have a blessed Easter when it finally arrives, whatever the weather. 9th Ode / Easter Canon. “We are an Easter People and ‘Alleluia’ is our song.” So said St Augustine some 1800 years ago; and it is still as true today as it was then. He was writing at a time when Christians were still very much in the minority, when the world was a dangerous place and, for many, life was “brutish and short”. It was against that background that Augustine declared the hope, the promise and the truth that gave Christians their strength and determination to stand against the tide of paganism and violence that beset the world around them. They were “Easter People” because they believed in Jesus’ resurrection: he had died but, by the power of God’s Holy Spirit, had been brought back to a new life which was witnessed by many of his followers at the time. They were an “Easter People” because they had decided to follow that same Jesus and to model their own lives on what he did and taught. Above all, they were “Easter People” because they had confidence in God despite anything the world might say or do to them. That is what they believed and that is why their song is “Alleluia”. “Alleluia” means “Praise the Lord”. The word has been used by Christians of all denominations for centuries. It is used most often at Easter and in the Easter season but is a good word whenever we want to praise God and to thank him for his goodness. There are times when we most certainly do not feel like praising God. Life can be tough through illness, loss of income, grief, arguments etc etc. When we praise God we are not saying that “everything is OK”. What we are saying is that, despite anything else that might be going on, God is good all the time. If it had not been for what God did through Jesus at Easter, there would be no Christianity, and we would not have the hope, the promise or the confidence in God that we do now. We know that Christ has been raised from death and will never die again – death will no longer rule over him. It is said that there are four short great prayers which everyone should have at their disposal. They are: please, help, sorry and thank you. The beginning of the psalm I’m looking at here could be summarised as “Help!” and the end as “Hurry up!”. There is an urgency about this prayer and I guess that is one reason why this psalm is one of the shorter ones – just five verses. It also seems to me that Psalm 70 fits in with this week in the Church’s calendar. 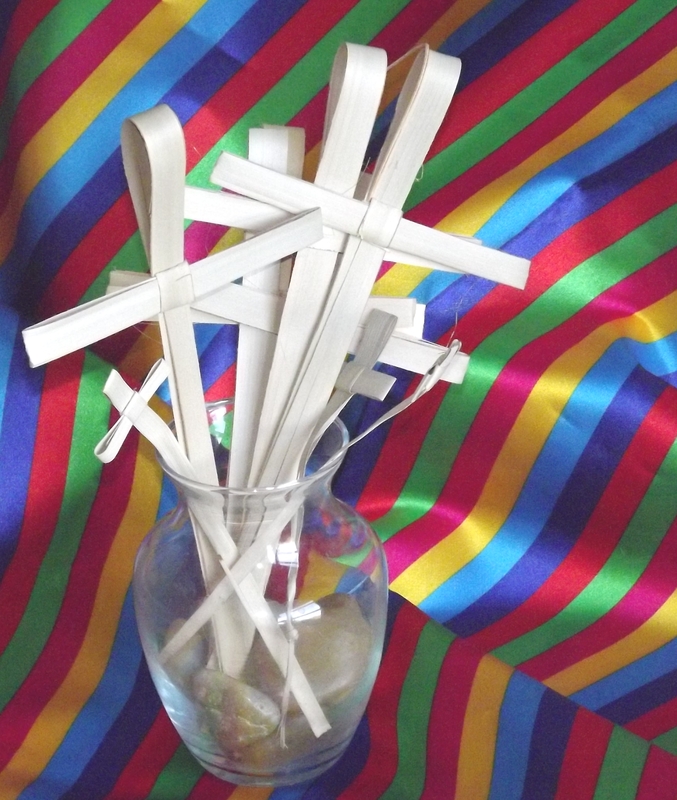 The week began with Palm Sunday and remembering Jesus arriving in Jerusalem on the back of a donkey. We then follow Jesus through the days and events that lead to his crucifixion; and then we celebrate his resurrection at Easter. At this point of the journey, Jesus is in Jerusalem with his friends and followers. He is aware, much more acutely than them, that things are coming to a head and that he will be presented with “the cup of suffering” to drink. Jesus is no masochist nor is he a fatalist. He has a choice but the consequences for him will be dire: he will suffer and die. Before Easter, there is Good Friday; before resurrection there is the cross. Surely Jesus would ask for God’s help and with some urgency to put it mildly. No matter what he knew or expected to happen afterwards, the prospects for that week would make anyone turn to God for help. I would not press psalm 70 too far or try to put words into Jesus’ mouth. I do suggest that it is OK to ask God for help and, if the situation warrants it, to ask him to hurry up. When the computer does not work there is a technical fix called “rebooting”. It basically means starting all over again and the simplest way is by switching it off and then switching it back on again (and hope you saved your work before hand). There is something of that idea in Easter. Jesus died (was switched off) buried for three days (make sure the power is completely off) and rose again through the power of God’s Holy Spirit (power back on again). As with any analogy do not press it too far but with rebooting it is usually either because a programme needs updating or because the computer has frozen and needs to be restored to proper working order. It is something like that last idea which is behind the phrase “new creation”. Somehow creation has got stuck, or infected with a virus, and needs rebooting. However, instead of wiping the whole memory and starting again, God has worked it so that the whole thing did not have to die. You could say that Jesus took the virus into his programming, was shut down and rebooted, thus destroying the virus and saving the world. It is not a perfect analogy but it does illustrate how the world can be understood to need saving from the result of the actions of just a few of its creatures. It is in a similar way to a whole computer being deemed to be infected by just a little bit of malicious programming. The point is that somehow the whole of creation is affected by Jesus’ death and resurrection without having to endure the suffering and death (the shutdown) that he did. Rebooting without shutdown you might say. Among the various ways of depicting what Easter means for Christians, I quite like this one from CBeebies. The artist uses sand in a simple but effective way to draw the cross, the hill, the empty tomb and Jesus. The narration is suitable for young children – and OK for adults too. If you do see it, watch out for the last touch of sand – it makes a profound theological point. Do you believe in the resurrection of hedgehogs? We do understand that in general it is best to leave a wild creature alone and that trying to help can sometimes make matters worse. On this occasion the hedgehog was spotted on the grass verge in broad daylight early one evening. It had obviously hurt its leg so it was carefully picked up (the wearing of gardening gloves was deemed necessary) and brought up the lane to our back garden. We found an old cardboard box and while one of us found worms and slugs with which to feed it, another went indoors to phone the RSPCA or anyone else who might help or advise. The evening wore on and we wondered whether we were going to have to make a better shelter for the poorly animal or else let it go and let it take its chances. Later than we would have liked, we got a call to say to take it to a local vets’. Apparently for wild animals there was to be no charge; which is just as well as I overheard one caller being told the evening charge was £119 and that was before any treatment costs. So off we went with the gerbil carrier, some straw and broken hedgehog. I guessed the outcome of our visit when the person staffing the reception said, “I’ll just take this through to the nurse and we will return the container to you.” How were we going to break the news to the youngest member our family? Well, a few minutes later a vetinary nurse came out with the empty container and bad news. Not only was the leg broken but there were other internal injuries and the hedgehog was destined for “hedgehog heaven”. To our relief the news was greeted better than we might have expected. We reasoned that dying at the vets’ was better than dying a slow death through starvation or being eaten by a fox. The nurse thanked us for our trouble and we went on our way. I mention resurrection but I do not mean reincarnation as some creature in another life in this world; nor do I mean resuscitation – a last minute reprieve or recovery for the animal. Some people talk about having a soul: some essential part of our identity which is invisible and separate from the physical body which we can see and touch. Some people would say that only human beings possess a soul, others would say that all creatures have them. Either way, resurrection would be understood as the soul escaping the body and thus escaping death. If you do not believe we have a soul then such a resurrection is meaningless. But the Christian belief in resurrection does not depend upon whether we have such a thing as a soul or at least on a particular understanding of what a soul might be. Nor does it mean that “saved” people cannot die. Rather it means that after we have died (that is to say, death is real) there is the hope and possibility of a new life – the result of God’s miraculous power which Christians believe was revealed by Jesus Christ’s resurrection. And if God is God, then he will do what is exactly right for everyone and for everything – that is one of the ways of understanding the idea of “a new heaven and a new earth”. What does that mean for our hedgehog? I don’t know, but I inclined to believe that resurrection is a real possibility and that what ever God does it will be what is right for that hedgehog. Where is that hedgehog now? Probably buried somewhere – but its future lies elsewhere. It is not a short book and there is plenty to think about: “Surprised by Hope” by Tom Wright. So far I have read most of it including the last chapter and the appendix. I discovered a while ago that there are some books that you don’t have to read every chapter in order nor read every single word. This is one of those books and if you like taking time over a book this is one you might like to read. The main theme is about the resurrection of Jesus Christ and the message of hope that it brings. Bishop Tom describes how this makes a difference both to how individuals may see their future after death but also to how we shape society in the present. In other words, how we live now as individuals and as a society can be done in the light of the message of hope the Jesus’ resurrection brings. A key point that the author makes is that the first Christians believed in and preached the bodily resurrection of Jesus Christ. This causes some people, including committed Christians, problems. If the phrase “bodily resurrection” conjures up a picture of a resuscitated body you would be forgiven for imagining that we’re talking about some kind of zombie! I remember a conversation with a Methodist minister who objected to the bodily resurrection on the grounds that it implied that Jesus was an animated corpse – his preferred take on the resurrection was to talk about it in spiritual terms. The problem with that view is that it seems to restrict the resurrection to the sphere of ideas and feelings. Tom Wright clarifies the position by reminding us that what the New Testament asserts is that Jesus really did die and then, through the action of God’s power, was raised to new life in a transformed body. Thus the person whom the disciples met after the resurrection was the same Jesus Christ they knew but with a new, real body. This event is unique in our experience and therefore not easily examined by sceptical enquiry. Either this event happened and is outside our normal experience or it did not happen. It is not credible to dismiss this event just because it lies outside out normal experience. If the resurrection of Jesus is real then it tells us something. To his disciples, after the shock and disbelief of their initial reaction, it told them that “Jesus is Lord”. That is to say, Jesus is both God and Messiah. (Working out the precise theology of that mystery has taken centuries, since Christians believe in one God but also believe that Jesus is God.) If Jesus is God and Messiah, then he is someone to be taken very seriously. In fact, it means that we have work to do. Tom Wright’s next point is that it then follows that both Christian Baptism and Christian ethics are based on the anticipation of our resurrection with a transformed body after death – just as Jesus did. Death, though real and painful enough, does not have the last word. The resurrection of Jesus Christ gives us a hope; a real, tangible hope but not just “spiritual wishful thinking”. The message of Easter is not first and foremost that death is not real (it is), nor is it that we may go to heaven after we die (we may), but that Jesus is Lord, Jesus was raised from the dead never to die again, Jesus went in his real, transformed body back to heaven (which means that there is a little bit of earth already in heaven). It means that heaven (where we could see God face to face) is a lot closer than we think and we have the possibility of earth being made more heaven-like if we work with the grain of God’s will rather than against it. This book is not for the general reader: if you find the latest Discworld novel, an Agatha Christie whodunnit or a Tom Clancy thriller challenging enough then this book may not be an easy read. However, if you’ve read C. S. Lewis, then you may find some food for further thought here to get your teeth into. Whether or not you decide to read this book, may I wish you a blessed Easter and may you, too, discover the hope that Easter stands for.